Get Involved! The best way to spread awareness for Breast Cancer is to get involved! Sure, donations are great, but volunteering no matter how big or small makes a difference. Below are a few great organizations to get involved with. Don't forget that there are many great organizations that support cancer research. Do the research and get involved! If you cannot find an event near you don't fret there are plenty of other ways to get involved. Click for more information on how to volunteer. Becoming an advocate for hope is a great way to spread awareness to everyone about breast cancer through social media. I love the event finder tool. This website feature allows anyone to connect and get involved with a great cause. For all my Utah readers there is an event on Oct. 11, 2014 called "Making Strides of Utah." This non-competitive 3-5 mile event helps not only those who have lost loved ones to breast cancer, but also those who are battling or have overcome this disease. Read more here about information on getting involved with the Utah event! You can help through fundraising, volunteering or becoming an advocate. Seriously, the Susan G. Komen organization has numerous of events and programs making volunteering even more rewarding! Who doesn't like volunteering, especially while doing something you love. Fashionistas: Why not host a Pink Fashion Show in honor of those affected by breast cancer. Runners: Help with planning a breast cancer run. Dancers: Assist in planning a Dance-A-Thon for breast cancer support! Sport Fanatics: Why not plan a football, baseball, hockey, etc... for breast cancer awareness/support! Bakers: Who doesn't love a baked goods auction, especially for breast cancer? I'm a sucker for a pink cupcake! Poets: Help plan a poetry reading in honor of Breast Cancer at your local coffee shop/cafe. Musicians: Assist with planning a concert! Do you have any other great fundraising ideas? Aren't those straws adorable! Seriously, they are perfect for parties! Good luck and best wishes for the giveaway. Also, make sure to read the terms and conditions! 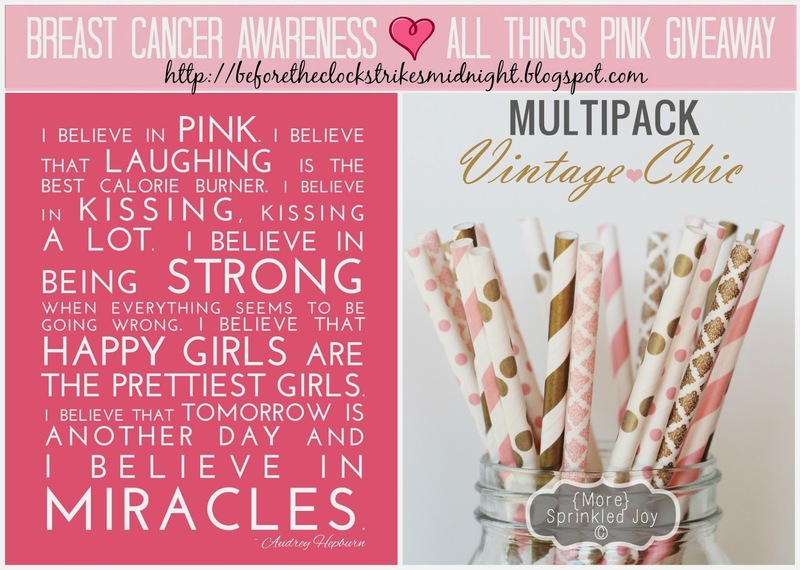 Don't forget to enter the All Things Pink Giveaway and the Puff Pastry Giveaway! I was not compensated to write/host this review. The print that says BElieve THEre is GOOD in the World is great! I like the Newborn Birth Statistics Subway Print. I like the Teacher Tree print with all of the classmates names. The teacher tree print is awesome! Home is where the heart is is my favorite! Even though it's kind of cliche it's so true!